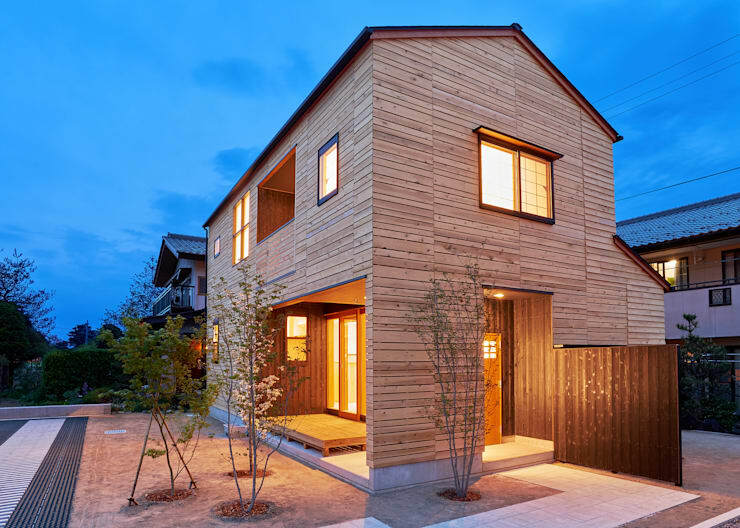 Wood clad homes were once adored for their beauty. Many of the traditional log houses also boasted of a modular design. They were built without a single use of nails. In Japan and in many Scandinavian countries, this practice is still prevalent. 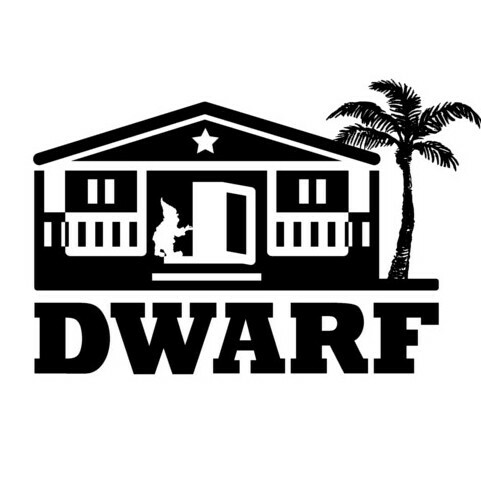 This helps the owners to dismantle the entire house, shift it to a different location and set it up from scratch without destroying any of its parts. High price of natural wood and concerns about deforestation are primarily responsible for the gradual decline of the popularity of this time of homes. However, this is once again showing signs on change. In the recent owners many prospective homeowners started using timber to build their houses. Many city dwellers started building log houses for leisure and relaxation. Today we are going to show you some of the most gorgeous examples of wood clad home. Malaysian traditional wooden huts still seen in different parts of the country boast of intricate designs. So don’t forget to gather inspirations from these houses as well. Could this be your perfect holiday retreat, away from the hustle and bustle of the city? 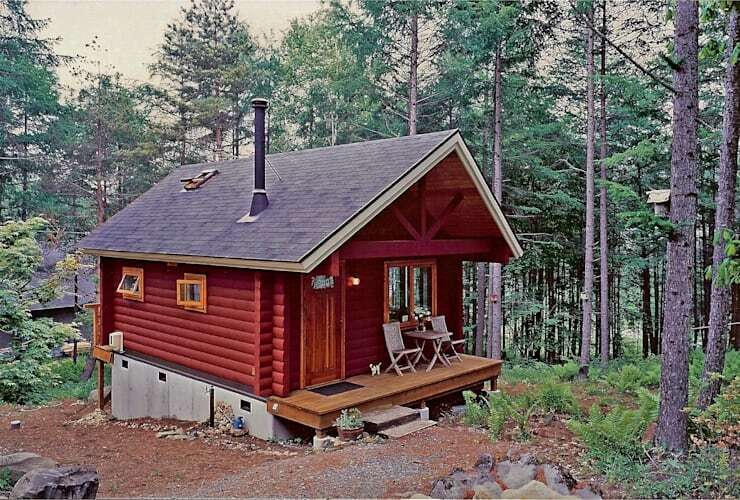 This log house has been designed with the help of locally available materials. Its simple style is in line with traditional design. It is designed with all kinds of modern comfort, a fully functional kitchen, living room and bedroom. This is best for a small family willing stay close to nature for at least some part of the year. Don't forget to see these super affordable family homes. Natural wood blends as well in contemporary structures as in the traditional ones. It is one of the most versatile raw materials for modern homes. 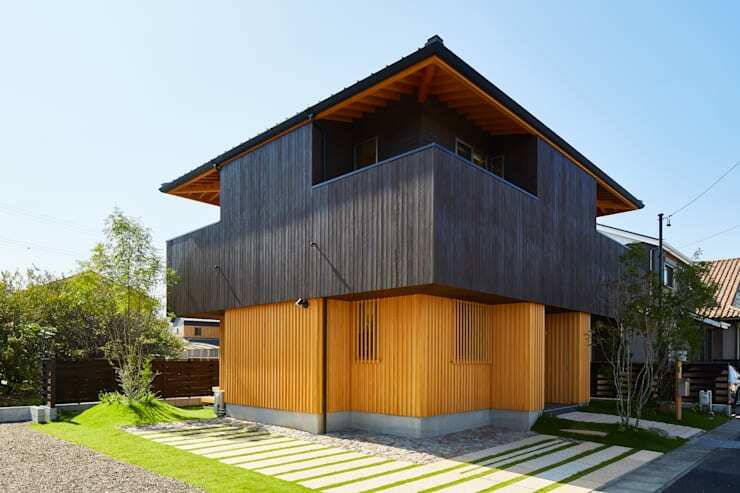 The architect of this house has a trend setting wooden structure for its owners. It has high gable roofing system, spacious patio and cheerfully decorated rooms. This house is aptly named “Mon Rêve” or My Dream. 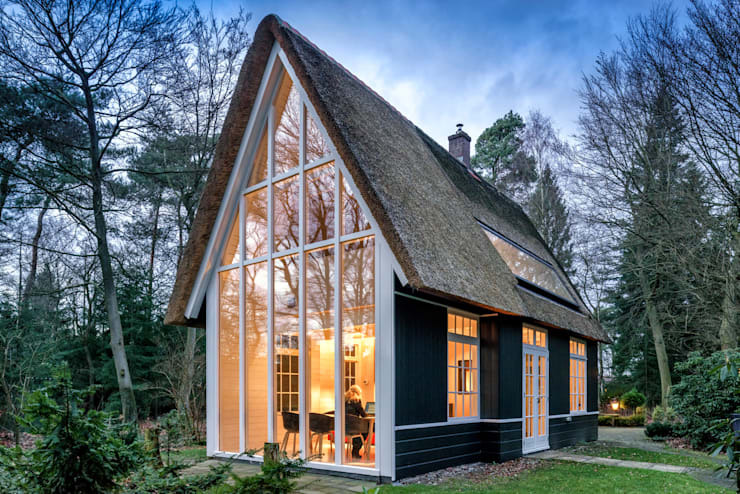 It not only boasts of a stylish wooden structure, but sustainable thatched roof. Solid wood provides excellent insulation to the interior atmosphere. Your home remains cool in blistering heat and warm in cold winter. Large glass windows, like the ones this of this house, help to the owners to enjoy a sumptuous view of the surrounding. This is two storey wooden house is a fantastic example of a cosy and comfortable family home. It has all the necessary ingredients of a modern structure like spacious open plan living room and a patio in front of it, small balcony on the first floor and rooms with plenty of natural light. The small piece of land on the front yard can also be converted into a beautiful garden. This cosy timber house is set in a picturesque backdrop. 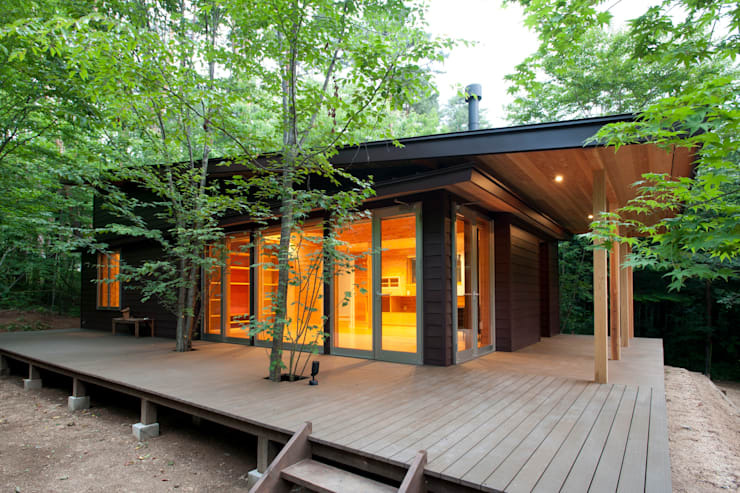 Its contemporary structure has been clad in natural wood. Owing the large doors and windows, one can enjoy the lively views from any corner of the home. It is also designed with a spacious terrace where the family can enjoy having small parties. The interior of this house is decorated in a graceful Japanese style. 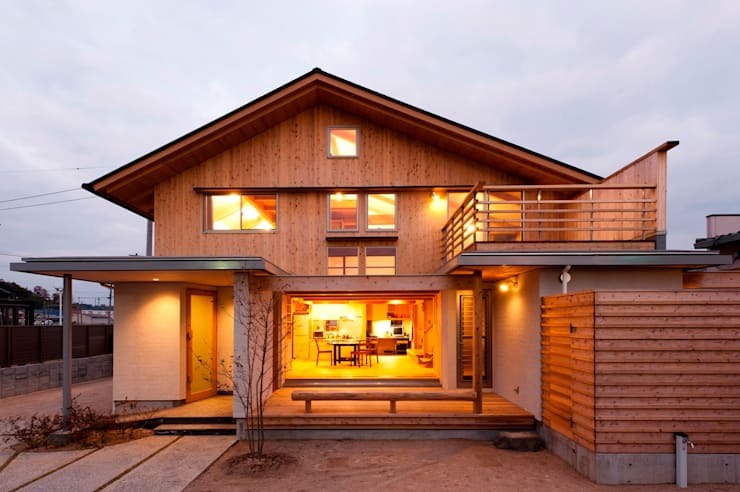 The environment friendly design of wooden houses is one of their most important features. The owners have also installed solar photovoltaic panels on the roof to avail an alternative and sustainable source of energy. The house is located in the middle of its own garden. The front door open up to a cheerful living room with kitchen and dining area. Some of the interior walls of the house are built from cork, another worthy and cost effective substitute to natural wood. 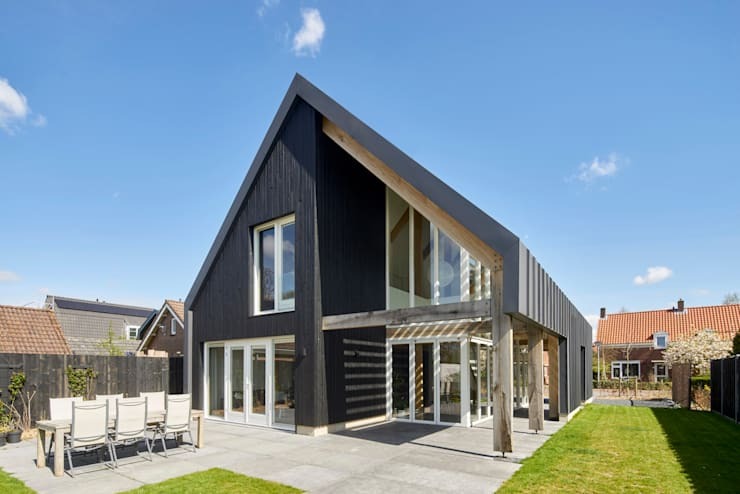 The wood clad walls of this trendy family home are something that you will remember for long. 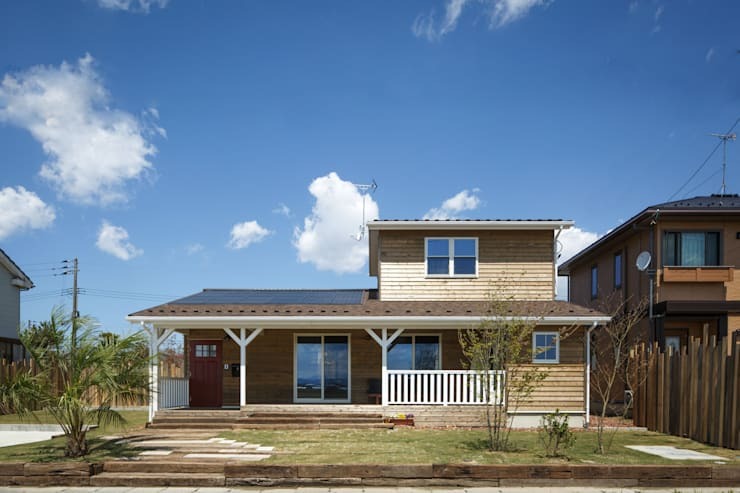 The house itself is designed according to contemporary design ideals. It is surrounding by a small garden. The interior is segmented into a double height hall, kitchen, dining area and comfortable bedrooms. The contrast between ground floor and first floor levels coated with dark colour gives this house a dramatic look. It is completely decorated with wooden walls and designed in a contemporary fashion. Its interior decked up with exposed wooden beams, solid wood flooring and wooden walls look even more stunning. A feel of wabi sabi has been induced with the choice of furniture, especially a naturally shaped dining table top. Check out these dreamy family house with many charming features. Which of these wooden house designs did you find most inspiring?